Chicks: Are the chicks getting enough to eat? Question: Are the chicks getting enough to eat? I see one at the back of the nest (or lying down) while the rest are eating? Is something wrong? Answer: When peregrine falcons select a nesting territory they choose an area that has a lot of food, in other words a lot of birds. 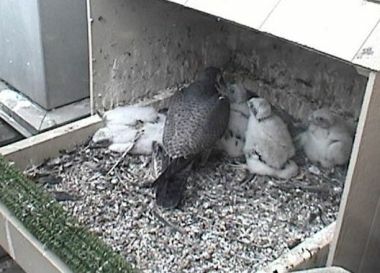 Peregrines prefer areas with an overabundance of food so there’s more than enough to feed themselves and their nestlings. The nest sites you see on camera in Pittsburgh are in excellent territories. Downtown Pittsburgh (Gulf Tower) and Oakland (University of Pittsburgh) have an overabundance of pigeons, starlings and house sparrows – especially in spring when the first broods fly. In addition there’s a wide selection of spring migrants who push through the area in April and May. There is plenty of food here in Pittsburgh. A mother peregrine encourages her tiny chicks to eat by making a “chup” noise while holding food in her beak. When she does this they sit up and open their mouths so she can drop food in. Listen for this on camera. So why would one chick lie down or face the wall while the rest are eating? He’s still full from the last meal! Sometimes the parents bring more food than their youngsters want. No problem. The chicks will eat when they’re hungry.